Preheat the oven to 375 degrees or preheat solar oven. Spray the muffin pans with nonstick cooking spray or use cupcake liners. Gently wash and dry the blueberries. In a small bowl, combine the oats and buttermilk, and let the mixture stand for about 5 minutes. In a medium bowl, combine the flour, baking powder, baking soda, cinnamon, nutmeg, ginger and salt; mix with a fork to blend and set aside. In a large bowl and using a fork, beat the egg, add the applesauce, and brown sugar combine well. Blend in the oatmeal/buttermilk mixture. Stir in the flour mixture only to combine, do not over mix. Fold in the blueberries. 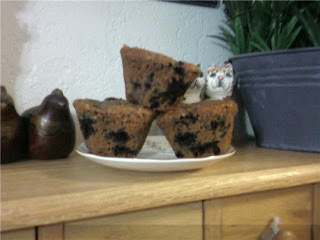 Fill muffin cups 3/4 full and top with a sprinkle of turbinado sugar if desired. In the oven - bake 15 minutes or until a toothpick inserted into the center comes out clean. In the solar oven - bake until done - it took mine about 30 minutes at about 275-300 degrees. * You can use 1 cup of milk plus 1 tbsp lemon juice or white vinegar if you don't have buttermilk. Let sit for 10 mins before adding to recipe. I use Fat Free Fortified Lactaid mixed with lemon juice and it works just fine.